There are lots of free M4P to MP3 converters enables users to convert common M4P files to MP3 for better compatibility with portable devices. But such music tools don’t work on iTunes M4P streaming music as Apple Music are not only encoded in M4P audio format but also encrypted by FairPlay DRM technology. If you’d like to play Apple Music M4P files on unauthorized devices like MP3 players via converting them to MP3 audio format, you’d better to look for a professional iTunes M4P to MP3 converter. As a matter of fact, there are also some excellent iTunes M4P to MP3 converters created by software developers in recent years. In this article, we will make a collection on top 5 Apple Music M4P to MP3 converter for your reference directly to save your time. The best M4P to MP3 converter for iTunes could be AudFree DRM Audio Converter, an outstanding iTunes DRM removal software. With built-in multifunctional DRM decryption technology, it has the ability to get rid of DRM lock from Apple Music, Audible audiobooks as well as iTunes audiobooks at 30X faster speed. Of course, the basic feature of this iTunes to MP3 converter could be conversion function. It can convert iTunes M4P music, Apple Music, audiobooks and any other common audio files, such as M4P audios to MP3, WAV, FLAC, AAC, M4A and M4B without protection with 100% original quality preserved. Besides, it allows users to customize ID3 tags, like title, cover, year, etc. in the accordance with unique needs. * All-in-one DRM removal tool for Apple Music, iTunes, Audible, etc. * Convert iTunes M4P and common M4P files to MP3, FALC, etc. * It costs $39.95 to get the full version. It’s well known that iTunes music files purchased from 2009 are encoded in M4P audio format with DRM technology. With easy-to-use and clean interface, myFairTunes is a M4P to MP3 converter freeware, which is well designed to remove FairPlay DRM from those iTunes M4P audio files and convert iTunes M4P to unprotected MP3 files. 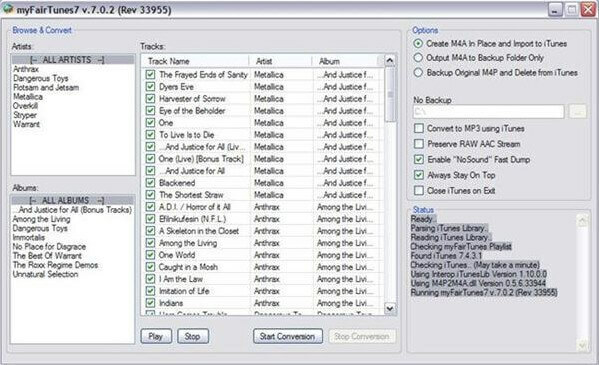 When you launch this free iTunes M4P to MP3 converter, it will scan the downloaded iTunes music streams on your computer automatically. Just simply press the ‘Start’ button, all DRM M4P files will be converted to MP3 format and saved on your computer. But you need to pay attention to the important point that it’s a little out of date as it supports for iTunes 7.5.0 or lower. * It’s a difficult to install with Microsoft .NET Framework 2.0. 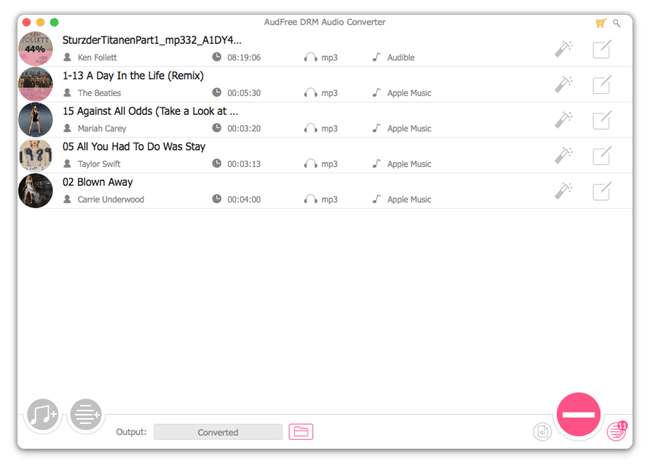 TunesKit Apple Music Converter is previously specialized in converting Apple Music files to common audio files for Apple Music lovers. But now, it has updated to the multifunctional iTunes DRM removal software, just like AudFree DRM Audio Converter. Thanks to this superior Apple Music to MP3 converter, you can convert Apple Music M4P files to MP3 while breaking DRM protection at the same time. It’s worth mentioning that it allows users to customize bit rate, sample rate and other output audio parameters to obtain better audio quality. Of course, it can also export Apple Music as original audio files. * It’s not free. You need to pay for $34.95 to unlock the limitation. Instead of using converting technology to extract MP3 tracks from iTunes DRM M4P audio files, there is also a traditional way to achieve the same effect, which is to use the recording technology to record Apple Music streams and save them as MP3 for playback. 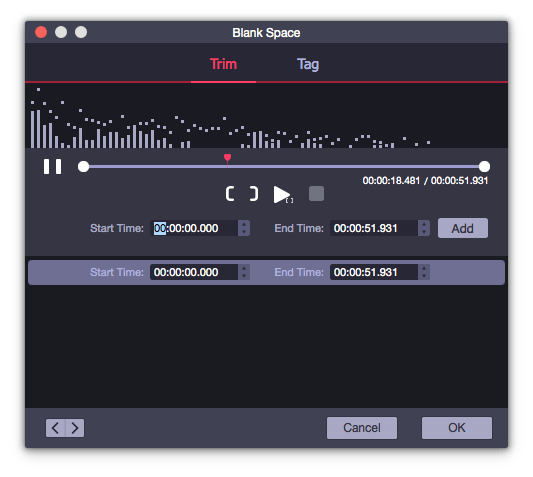 AudFree Audio Capture is such a commercial audio recording tool, with which you can record audio tracks from Apple Music and any other streaming music services, like Spotify, Deezer, Tidal, etc. and convert recorded Apple Music tracks to MP3, FLAC, WAV, AAC, etc. What’s more, it comes with the editing function enables you to split Apple Music recordings into smaller audio clips and customize ID3 tags as well. * It will waste lots of time as it works in real-time recording. Similar with AudFree Audio Capture, Apowersoft Free Online Audio Recorder is also an audio recorder software. But it’s a free iTunes M4P to MP3 converter online as it doesn’t require users to install extract software on computer but record streaming music online for better playback. By adopting audio recording technology, it is capable of recording audios from iTunes, online radio station, voice chat, etc. and saving them to MP3 and other plain audio formats. It’s important to note that you still need to install a launcher to avoid the recording process stopping abruptly. * There is no extract software to install. * Convert iTunes MP4 to MP3 online for free. * The output audio quality could be not ideal. * Without multi-track audio recording technology. There are top 5 best free and paid iTunes M4P to MP3 converters, online and offline. No matter you are using Mac or Windows computer, you can find the suitable tool to convert iTunes to MP3 with ease. As for which iTunes M4P to MP3 converter to choose, it depends on your actual situation and option. Anyway, no matter which you choose finally, you can easily convert unprotected iTunes Apple Music M4P streams to MP3 and transfer them to all popular devices for listening without problem. Just select the right one and start to convert Apple Music to MP3 and transfer them to your device for playback. If you have used other professional iTunes M4P to MP3 converter, please be kind to write it down in the comment area to make this article more complete.